A 21-year-old woman presented to the emergency department (ED) with recurrent chest pain, and a normal echocardiogram (ECG), and initial set of troponins. There was no objective evidence of myocardial injury; however, there was a recent history of unexplained elevated troponin, T-wave abnormality, and nonsustained ventricular tachycardia. A cardiac computed tomography angiogram (CCTA) was ordered. 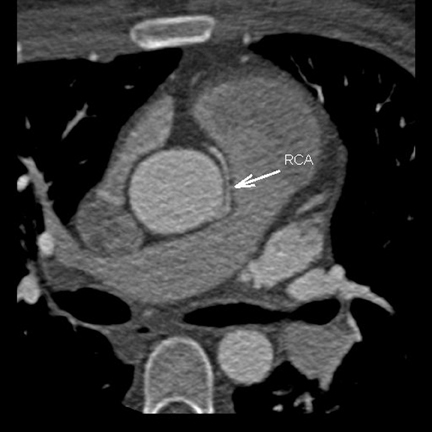 The CCTA revealed an anomalous origin of the dominant right coronary artery (RCA) from the left coronary sinus of Valsalva and with an interarterial course (Figure 1). The proximal 2 cm of the RCA was intramural and with acute angulation. The rest of the study was normal. The prevalence of coronary anomalies (CA) in the general population is ≤ 1%. CA may be classified as either benign or malignant based on origin, course and termination. 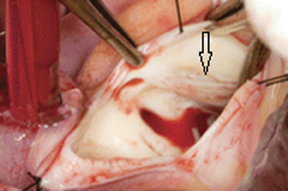 Surgical repair of an anomalous RCA from the left cusp remains controversial;1 however, due to the patient’s symptoms, prior history of elevated troponins and arrhythmia, the patient was admitted and underwent cardiac surgery (Figure 2) with reimplantation of the RCA. A pre-operative ECG was normal. An invasive coronary angiogram was not performed. Two weeks postoperative, the patient returned to the ED with new onset of chest discomfort, for which a repeat CCTA was performed. 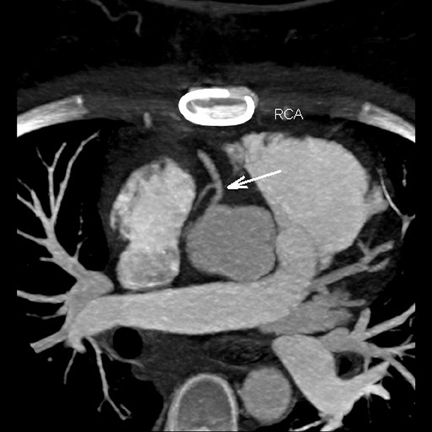 The subsequent CCTA demonstrated a patent reimplanted RCA (Figure 3), and the patient was diagnosed with postsurgical pericardiotomy (Dressler’s) syndrome. CCTA is well recognized as the imaging study of choice for the evaluation of congenital coronary anomalies in adults. Also, CCTA is rapidly becoming the preferred study, in low- to intermediate-risk patients, for the evaluation of chest pain in the ED. CCTA has proven to be as accurate as the current standard of care, but with the added advantage of decreasing patients’ length of stay by 55% and reduction of costs by 38%.2 Additional potential advantages of CCTA include the avoidance of discharging patients from the ED with acute coronary syndrome (2% to 13%) that have negative troponins and ECG. With the Philips iCT, studies in these types of patients are routinely acquired with a prospectively-gated axial technique (Step & Shoot Cardiac, Philips Healthcare, Cleveland, OH, USA) at 75% physiologic-cardiac phase, 100 kVp, in 2 heart beats (8-cm z-axis coverage), and with 70 cc IV of low-osmolar contrast. In preparation for the CCTA, patients are routinely administered 100 mg PO of metoprolol in the ED, with an additional IV dose (up to 30 mg) in the CT suite if needed. Within 5 min prior to the acquisition, patients are given sublingual 0.4 mg of nitroglycerin to achieve coronary vasodilation. The raw data is processed with the iDose4 iterative reconstruction technique. When compared to standard reconstruction, iDose4 reduces noise and significantly improves spatial resolution at low dose. Images are reviewed on the Philips IntelliSpace Portal. CCTA is the study of choice for the evaluation of congenital coronary anomalies in adults. Patients with chest pain, that are at low- to intermediate risk for a major adverse cardiac event (MACE), presenting to the ED can be accurately and rapidly evaluated with CCTA. In most cases, the studies are of high quality and low radiation dose. A negative CCTA results in faster discharge from the ED and significant cost savings. Also, patients discharged from the ED with a negative CCTA have shown to be MACE free at 2 years,3 thus providing additional prognostic value. Lee BY. Anomalous right coronary artery from the left coronary sinus with an interarterial course: Is it really dangerous? Korean Circ J. 2009;39:175-179. Goldstein JA, Chinnaiyan KM, Abidov A, et al. The CT-STAT (Coronary computed tomographic angiography for systematic triage of acute chest pain patients to treatment) trial. J Am Coll Cardiol. 2011;58:1414-1422. Schlett CL, Banerji D, Siegel E, et al. Prognostic value of CT angiography for major adverse cardiac events in patients with acute chest pain from the emergency department: 2-year outcomes of the ROMICAT trial. JACC Cardiovasc Imaging. 2011;4:481-491. Cardiac CTA in the ED: Congenital Coronary Anomaly. Appl Radiol.